Automation Connection has created a premiere solution called DTVGameControl. 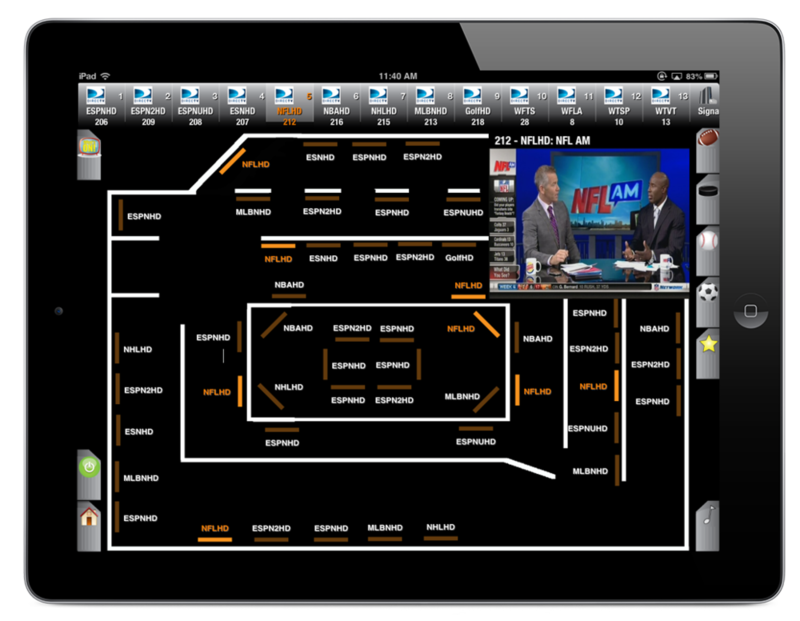 This iPad floor plan based application is ideal for controlling and managing DirecTV, Cable and Dish Network Receivers, Video Tiling, Video-Walls even Audio in Sports Bars and Restaurants. This perfect turn key solution allows your staff the ability to focus on the customers and their needs rather than wasting time trying to find the next BIG game! Not only increasing customer satisfaction but ultimately increasing your sales! Click on Image to Expand "Non-Matrix Version"
DTVGameControl provides staff quick access to ALL daily sports games by zip code and easy sport themed icons. Our "Game Day" tabs detail sporting events currently playing. The channel guide provides games throughout the day. Your staff will no longer be embarrassed searching for a game while your customers miss the next Sports Center highlight play. DTVGameControl Morning Sequence: This feature will automatically turn on all of your TV's, to the desired set channel and time each morning. DTVGameControl Choose from our Matrix, Modulation or Non Matrix versions. Depending on the distribution, our application will accommodate the smallest to the largest of venues. See demo videos below. Click on Image to Expand "Matrix Version"
DTVGameControl allows the end user to create and control the passcode. One easy passcode for all authorized user/ staff. No more "well meaning" customers messing with video! The application is simple and easy to use because its based on your floor plan. Simple to see what's playing on all of your TV's with easy touch control! No more "which table wants what game?". It's as easy as simply touching the TV on your iPad screen. Staff time is no longer wasted creating better service to customers. DTVGameControl has done all the work for you! Simple sports ball themed icons show all real time events. You can even add your own favorites Gone away are the days of "seek and find". DTVGameControl gives authorized staff the ability to meet individual gaming needs quickly and professionaly. DTVGameControl is the manufacturer and does not sell directly to the public. If interested please contact us to become a Preferred Dealer or locate one in your area.